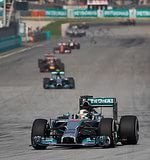 After each and every Grand Prix during the 2014 season, we've asked you to give your rating for the event out of five stars - one for a very poor event, and five for the best that Formula One can offer. Now it's time to put it all together and rate the season as a whole. It's been a long year, but dig deep and cast your mind back to combine those early months with the tense championship finale, to come up with a season-long rating. It was a rollercoaster of a season, with highs of battling teammates in Bahrains and lows of rubbish racing in Russia. In between, there were on track fights and off track squabbles, races that delivered more than expected and those that absolutely disappointed. Now's your opportunity to rate the season, and give it a score out of five - remember, one star for terrible and five stars for the best season possible. Naturally, it's only fair to judge the drivers individually as well as the sport as a whole. Each race has seen a driver of the day selected, and although there was only one champion, there were plenty of other drivers who got some votes during the year. There was plenty of fast and furious action out on track, overtaking galore and plenty of strong drives that deserve a second look. So, here's your chance to say, who performed the best for the entire year of 2014 from every driver that scored a point during the season? Who was your driver of the season? When we've got all the votes in, we'll count them up and have a quick review. Was it a good season, a classic, one to be remembered for the ages? Or was it one that we won't be telling the grandchildren, one that we'd rather was pushed to the back of the history books? Next post He's gone all red!